Over 350 RVs, including folding camping trailers, truck campers, motorhomes, travel trailers, toy haulers and fifth wheel travel trailers ranging in price from $6,995 to more than $400,000. New 80,000 square foot arena expansion! 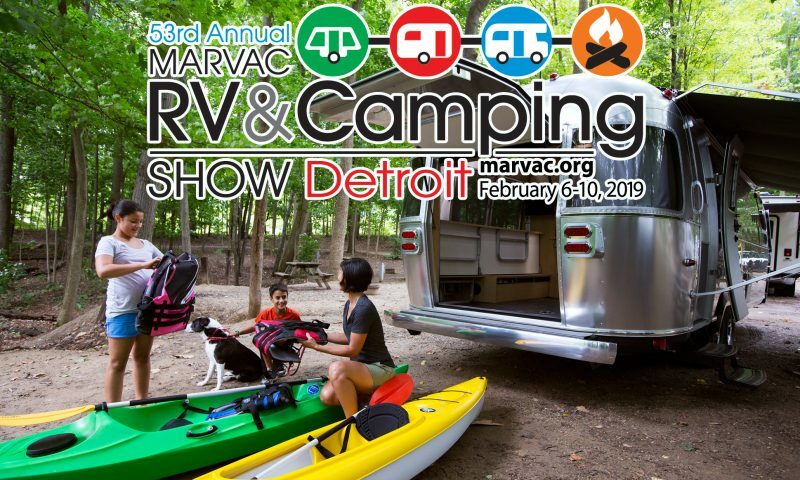 Sixty booth exhibitors featuring parts and accessories, campground information, on-site RV financing and RV rentals make this the complete RV show experience. Educational seminars open to the show attendees. 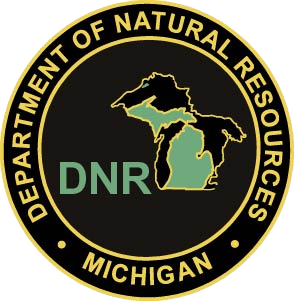 Take a break from browsing the hundreds of RVs to visit with Smokey the Bear on Saturday February 9 from 11:00 a.m. to 2:00 p.m.
Tom Daldin and Jim Edelman from the local PBS series “Under The Radar Michigan” return! 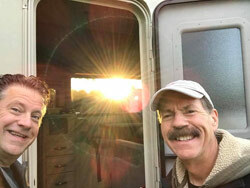 The duo will tell tales of their travels across Michigan, including their jaunts around the state in an RV named “Steve.” The pair is scheduled to speak on Saturday, February 9 at noon and 1:30 p.m. 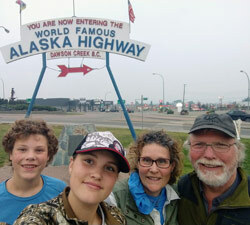 Listen to RV travel tales from the Parkbound Maitland family, the soon-to-be Guinness World Record holders for visiting all 418 U.S. national parks units. The Maitland’s, from Jackson, Mich., will share stories and camping tips from their adventures, including why they love camping with their fifth wheel, “The Whale.” Catch their presentation Saturday, February 9 at 3 p.m. or Sunday, February 10 at 1 p.m. Adult admission (ages 13 and over) is $10; senior admission (ages 55 and over) is $9; and children 12 and under get in free! Parking not included in show admission. Parking starts at $5.00 per vehicle. Coupons available at www.marvac.org, Pinterest, Facebook and Instagram. Starting January 28, at Tubby’s Sub Shops, Big Boy restaurants and in area newspapers. With this coupon, consumers receive $1 off any adult or senior admission. 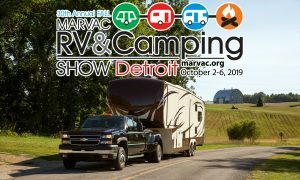 While at the show, make sure to enter the “Enjoy Michigan, Compliments of MARVAC” for the chance to win one of several camping or RV-related prizes from MARVAC members! This presentation by Dan Colaes from KING will discuss how to enjoy live satellite TV or free digital TV wherever the fun takes you in your RV. Join Nick Moreland from PullRite as he reviews various fifth wheel hitch options and towing solutions, including towing a fifth wheel with a short bed truck, lightweight fifth wheel hitches for easy removal, fully removable fifth wheel hitches and OE drop-in hitch options for your truck. Want to keep connected while getting away from it all? Join Dan Colaes from KING as he discusses how to connect to an existing Wi-Fi source at significantly further distances and at faster speeds than using a phone or laptop. Discover the safety benefits of using a rear viewing towing cameras for an RV, presented by David Forrest of Brandmotion. Join Nick Moreland from PullRite as he reviews various fifth wheel hitch options and towing solutions, including towing a fifth wheel with a short bed truck, lightweight fifth wheel hitches for easy removal and fully removable fifth wheel hitches and OE drop-in hitch options for your truck. Want to keep connected while you’re getting away from it all? Join Dan Colaes from KING as he discusses connecting to an existing Wi-Fi source at significantly further distances and at faster speeds than using a phone or laptop. Learn about the ins and outs of your towable RV suspension system and how to improve its performance and durability with Brendan Aukerman of MORryde International, Inc. Listen to the hosts of Under the Radar (UTR) recount their trips across Michigan in and out of an RV, their favorite spots and more! 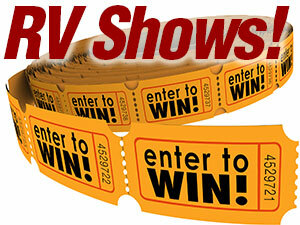 Thinking about renting an RV? Find out about how easy it is to get on the road in a rental from the Alvin Duncan, rental manager with General RV Center. Join Nick Moreland from PullRite as he reviews various fifth wheel hitch options and towing solutions, including towing a fifth wheel with a short bed truck, lightweight fifth wheel hitches for easy removal and fully removable fifth wheel hitches. 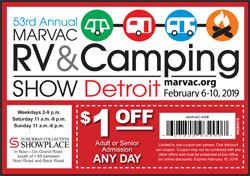 Coat check will be available for all visitors to the Detroit RV & Camping Show. All organizations are non-profits and will be requesting a $1 donation per coat. Michigan Crusades for Kids (C4K) provides local children affected by life-threatening illnesses with adventure-based special events. Police, Fire and Military members are the core of our volunteer team. Save-A-Soul Animal Rescue, Save a Soul is a non profit 501(c)(3) animal sanctuary and rescue helping animals from neglect, abuse, and hoarding situations.Terri Looby, Coordinator, msterri24@yahoo.com, www.facebook.com/saveasoulsanctuary. A special thank you to Dave Beeman and ArtCraftDisplay.com for their generous donation of the items needed for the coat check.